More than 40 businesses will be illuminated when Light Up Cheltenham returns for three weeks from this Saturday (February 2nd). Among the prominent buildings to be lit is the historic dome that now makes up part of The Ivy Montpellier Brasserie. 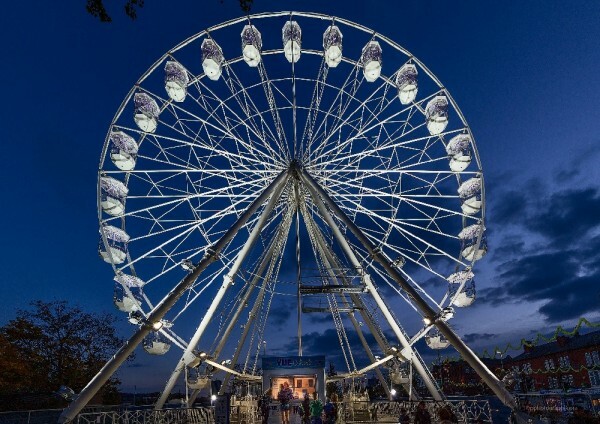 Cheltenham Business Improvement District (BID) is organising the three-week celebration, which will also feature a giant observation wheel, standing more than 35-metres high in Imperial Gardens. Historic buildings on The Promenade and Clarence Street will also be taking part in Light Up Cheltenham for the first time. Luc Morel, General Manager at The Ivy Montpellier Brasserie said: “We’re looking forward to being involved in this year’s Light Up Cheltenham alongside many other local businesses and iconic buildings in the area. There will be a range of colours displayed and all the buildings will turn red for Valentine’s Day. As well as many buildings having floodlights for the first time, other permanently-lit businesses will change their colour schemes to be part of Light Up Cheltenham. Spectacular street theatre drumming group Spark!, who were a massive hit at the first Light Up Cheltenham last year, will return to launch the event from 5pm on Saturday. Further entertainment will be provided by the Photon Juggling LED Glow Show on Saturday February 16 at the start of the half-term holiday. BID Director Kevan Blackadder said: “The response from businesses of all kinds has been fantastic. The community spirit has shone through, with so many people wanting to be involved. The giant wheel will operate from 3pm every day with extended operating times at weekends and throughout the half-term holiday. A ten-minute ride will cost just £5 for an adult, £4 for a child and a family ticket is £15. The full list of buildings and businesses involved is: The Promenade: Queens Hotel, 131, Municipal Offices, Neptune’s Fountain, LK Bennett, White Stuff, GAP, Crew Clothing, Karen Millen, Hooper Bolton, Keith Scarrott Shoes, London Camera Exchange, Silver Moon, TM Lewin, Promenade Antiques, Coventry Building Society, Martin & Co, Simon Burn Solicitors, Datasource, Knight Frank, Cotswold Transport Planning, Elliot Oliver, Kingsley Evans, Langley Wellington, Hamptons, Enhance, NFU Insurance, Junkosha, Cheltenham Mortgage Advisors, Bare-Faced Medical Aesthetics, CGT Lettings.